With the unparalleled success of Glock’s namesake polymer-framed pistol, it was inevitable that imitators would try to dethrone it. Some drew too much inspiration too soon, like the Smith and Wesson Sigma line, while others, like the Springfield XD, offer shooters a different flavor of polymer pistol. One company to challenge the the Austrian automatic’s claim to the throne is Lone Wolf Distributors. If the name sounds familiar, it should. Lone Wolf Distributors has been making quality replacement parts for Glock firearms for years. It was the next logical step for the company to build the entire gun. Though, it obviously can’t simply build a Glock and stamp its name on it. No, the company's Glock-inspired Timberwolf is dimensionally and aesthetically different from the original, but can use nearly every part of an equivalently sized Glock of the same caliber. This raises a question: Why buy the Timberwolf over a standard Glock? To put this dilemma to bed, we compare a full-sized Lone Wolf Timberwolf against the original Glock 17. The reason I chose to the G17 to square off against the Timberwolf has more to do with personal bias than scientific method. I’m a tremendous fan of the full-sized Glock 17, and use it almost exclusively as my go-to competition pistol. At some GSSF and IPSC matches, many shooters would have custom Glocks adorned with Lone Wolf parts. The logical conclusion most would arrive at is that they are upgrades to the platform. So, when I saw that Lone Wolf Distributors was making an entire pistol, I wanted to see if it could put my old buddy out to pasture. What’s odd about these pistols is that, even though they are extraordinarily similar, they manage to have differences in key categories that make them feel like substantially different pistols.To better quantify these differences, both handguns were put through four different tests under identical conditions with both measurable and subjective outcomes. Certain aspects of a firearm’s design are difficult to quantify without delving so deep into data points that they become meaningless to all but a handful of engineers. To make the information easier to digest for layman, a mix of data-driven outcomes and a series of simple “better than” or “worse than” questions fielded by a small sample group of available test shooters were used. The first of which was to test the raw accuracy of both handguns. While both handguns use the same locked breech design and have identical barrel lengths, the fit of the barrel to the slide and the slide to the frame also influence accuracy. In many ways, accuracy reflects the overall build quality of a particular firearm, especially when paired off against another using the same operating methods. Four brands of ammunition were evaluated representing both defensive ammo and plinking varieties. Despite being similar enough to interchange parts, the two pistols exhibited distinct ammunition preferences. The Timberwolf seems to have exclusively expensive taste, achieving better performance with Federal American Eagle and Federal HydraShok ammunition. The stock Glock 17 did exceptionally well with bargain-priced HotShot ammo and premium defensive ammo from Hornady. Squeezing the most performance possible out of either pistol is simply a matter of finding the ammunition it prefers through trial and error. The surprisingly superior accuracy of less expensive HotShot over Federal in the Lone Wolf Distributors pistol highlights the necessity to try out several different brands of ammo before choosing one. Since each pistol performed better with different ammunition types, this test must be considered a draw. The only real winners are the shooters who buy them, since either is more than accurate enough. Another tremendously important aspect of any pistol’s performance is its ability to run under adverse conditions. With this in mind, both handguns were degreased before running 300 rounds of various ammunition types through them 15 rounds at a time. During this abridged torture test, both pistols became dangerously hot, as all rounds were fired in under five minutes. Despite this, the only malfunction encountered was caused by an unseated magazine that dropped out of the magwell during a hasty reload. Again, both firearms performed identically. So, in an attempt to distinguish them, I installed a SilencerCo threaded barrel and a direct-thread sound suppressor from Innovative Arms. During this more extensive reliability test, the Timberwolf ran into a few issues with HotShot 115gr FMJ ammunition. When running the somewhat underpowered ammo, the Timberwolf would fail to completely return to battery about once every other magazine. This is presumably a result of the excess weight of the suppressor combined with the tight fit of the Lone Wolf pistol’s frame to slide. While the millimeter gap could be remedied by applying slight pressure to the rear of the slide, it’s something to be aware of if shooters intend to run that brand of ammo through their can. That said, more appropriate ammo for suppressed use like subsonic 147gr XTP from Hornady ran without issue and was pleasantly quiet. Slight advantage: Glock 17. Which brings me to a much more subjective issue: ergonomics. What’s frustrating to gun designers is that they aren’t simply a measure of how accessible the controls of a firearm are. Often they’re a combination of that and the user’s past experiences. The later of which is virtually impossible for engineers to speculate. Rather than simply measure the grip diameter, distance to trigger or other frame dimensions, I took four shooters with limited Glock experience to my range and had them run drills and evaluate the grip angle, material, checkering and controls. Certain impressions of the pistols were universal. For example, all shooters believe the Timberwolf has a substantially smaller grip despite only being a small fraction of an inch smaller. Also, every tester, save for one larger individual, commented on the easy-to-reach magazine release compared to the standard Glock. It's important to note, though, that this could be remedied by installing a factory-made extended magazine release for around five dollars. Even still, the lack of extended controls is a detriment to the Glock. Minor advantage: TimberWolf. What about felt recoil and recoil mitigation? The two pistols operate identically, use the same length barrels and locking systems, yet feel distinctly different when fired. While initially this was perceived to be a result of the Timberwolf’s shorter length of pull, it is actually the result of an unusual factor: polymer flexural strength. That’s a really impressive way of saying that Glock polymer has more give than the one used by Lone Wolf. This is normally unimportant, as long as it allows proper function of the handgun. The reason it affects felt recoil is the frame acts as a recoil buffer to the shooter’s hand. The Glock’s more elastic grip resulted in a noticeable reduction in felt recoil. This is even more impressive, given the gentle nature of full-sized pistol’s recoil when chambered in 9mm parabellum. Advantage: Glock. The last area of comparison is aftermarket support. This is normally fairly straightforward, as more prolific designs tend to have more available accessories. 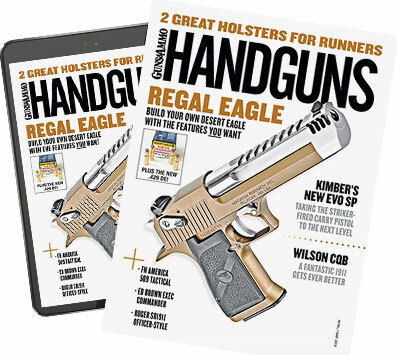 However, since both pistols accommodate the same magazines and holsters, the differences are more nuanced. In pursuit of these fine details, the only thing separating the two are their railed dust covers. The Glock features a single spacing slot on its rail, while the Timberwolf has three. This may seem inconsequential, but when mounting a tactical light or laser, it can be important. Each spacing slot allows a different mounting location for these accessories. If a laser or light is designed to mount closer to the trigger guard than the Glock’s singular spacing slot allows, the device can be too far forward and either be affected by muzzle blast or interfere with suppressor use. Again, these guns are more similar than different, so finding areas of contention among them is difficult. Advantage Timberwolf. So, which pistol should should a shooter purchase if given the choice? Honestly, whichever fits them better. Both the Lone Wolf Distributors Timberwolf and Glock 17 were nearly flawless in terms of reliability, and both exhibited sufficient accuracy for both plinking and combat/home defense use. This may seem like a cop-out, but it’s actually high praise for the Timberwolf. The fact that the Glock didn’t simply mop the floor with a design meant to emulate it shows that the engineers and builders at Lone Wolf are truly experts of their craft. Glock has hundreds of millions of dollars behind their products. If Lone Wolf Distributors can contend with a brand whose humble slogan reads, “Perfection,” they’re pretty damn close themselves.